Bernt Elsner leads the competition team at CMS REICH-ROHRWIG HAINZ and works alongside partner Dieter Zandler and four associates on a broad range of matters. Although Elsner is perhaps better known for his public procurement practice, the firm’s competition work has picked up in the past few years. He says his team is organised to advise clients on a Europe-wide basis. Recently, the team acted for Ceratizit when the cutting-tools manufacturer acquired KOMET Group; advised French tyre manufacturer Michelin on its acquisition of a stake of German auto centre operator Auto-Teile-Unger; and SOCAR Energy Holdings on merger control relating to its entry into the fuel market after acquiring filling stations owned by A1 company and Pronto Oil firm. CMS DEBACKER merged with Nabarro and Olswang in May 2017, creating the sixth-largest global law firm. Olswang was previously a highly recommended practice group in GCR’s Belgian rankings, and its former practice head Dirk Van Liedekerke now co-leads the merged competition practice alongside state aid specialist Annabelle Lepièce. The firm is working on several state aid cases, including defending the State Secretary of the Brussels Capital Region before the Tribunal of First Instance of Brussels against complaints by an association of private recycling companies about €1.5 billion in state aid granted to a public waste management company. The Belgian state has appointed the firm as its representative in all state aid proceedings brought by the European Commission. The team previously advised Medi-Market, which had unsuccessfully sought interim measures, on a complaint to the Belgian competition authority accusing the Association of Pharmacists of engaging in restrictive practices. The Brussels office is counselling the Proximus Group on complaints against the acquisition of broadcast channels VIER and VIJF by Telenet/Liberty Global; and on a restrictive agreements and abuse of dominance complaint against Telenet regarding its exclusively arrangements. CMS HASCHE SIGLE continues to be visible across several cities in the German market. It has a large team of 13 partners, one counsel and more than 20 other qualified lawyers spread across offices in Frankfurt, Stuttgart, Munich, Hamburg and Düsseldorf, as well as a Brussels contingent of German lawyers that includes three partners. The team has clients like Vodafone, Allianz, Porsche and Volkswagen Truck & Bus on its books. The team acts for the German Brands Association as a complainant in the Federal Cartel Office’s investigation into food retailer Edeka over allegations it illegally pressurised suppliers to retroactively apply special discounts following its acquisition of discount retailer Plus. Germany’s competition enforcer confirmed Edeka’s conduct was illegal in 2018. The firm is also advising Volkswagen in its bid to acquire US truck maker Navistar; and Atlas Copco on the sale of its road construction equipment division to French industrial and construction company Fayat Group. The team at CMS DERKS STAR BUSMANN is headed up by Edmon Oude Elferink, who is based in Brussels, but spends two days a week on average in Amsterdam and Utrecht. Elferink works with fellow partner Robert Bosman and four senior associates. In merger control, the team assisted Oaktree Capital on the sale of Dental Clinics to Nordic Capital. The Dutch Health Care Authority and the competition authority approved the deal without conditions in 2018. The team was also co-counsel to NYK in the European Commission’s roll-on roll-off shipping cartel probe, which resulted in the EU enforcer issuing fines of €395 million against four maritime car carriers – although NYK had its fine reduced to €141 million. The firm also counts GlaxoSmithKline, McDonald’s, BMW and Coca-Cola as clients. Partner Małgorzata Urbańska heads the competition group at CMS CAMERON MCKENNA, which counts six associates. The team successfully defended Bombardier’s rail equipment division against the Polish enforcer’s finding that it rigged bids in a tender by Polish Rail Company. The firm previously counselled natural gas incumbent PGNiG in an appeal that challenged fines the Polish competition agency imposed for an alleged failure to implement stop-gap commitments imposed during an ongoing investigation of the company’s market practices. In merger control work, the team advised Lithuania retail group Maxima on its acquisition of Emperia Holding, which owns the Stokrotka retail chain stores in Poland. The deal was cleared in Phase II. The team also advised Panattoni Development, the biggest developer of industrial and warehouse premises in Poland, on notifications for joint ventures with Japanese construction company Kajima and residential property developer Marvipol. Maxim Boulba heads the practice at CMS RUSSIA, which does impressive antitrust work. Hasbro, Kawasaki Kisen Kaisha (K Line), Nippon Yusen Kabushiki Kaisha, Mitsui OSK Lines and others lean on CMS for its competition expertise. The team secured unconditional merger clearance for the establishment of a joint venture between its client K Line and three other container shipping companies. CMS also obtained full clearance for SüdBG, a fully owned subsidiary and special-purpose vehicle of LBBW, in relation to the German commercial bank taking control over the Janoschka Group. For toy company Hasbro, CMS advises on distribution and unfair competition issues, including conducting a mock dawn raid. It does similar work for Boehringer Ingelheim, advising on distribution and public procurement, obtaining rulings from the FAS and representing the client before the competition authority on public procurement matters. CMS ALBIÑANA & SUÁREZ DE LEZO lost practice leader Patricia Liñán to Bird & Bird in November 2017, but new head Carlos Vérgez has plenty of experience, having worked on Spanish competition matters in various firms for more than 18 years. He is assisted by one senior associate, Aida Oviedo, who has been essential in designing and implementing audits and compliance programmes for CMS clients. 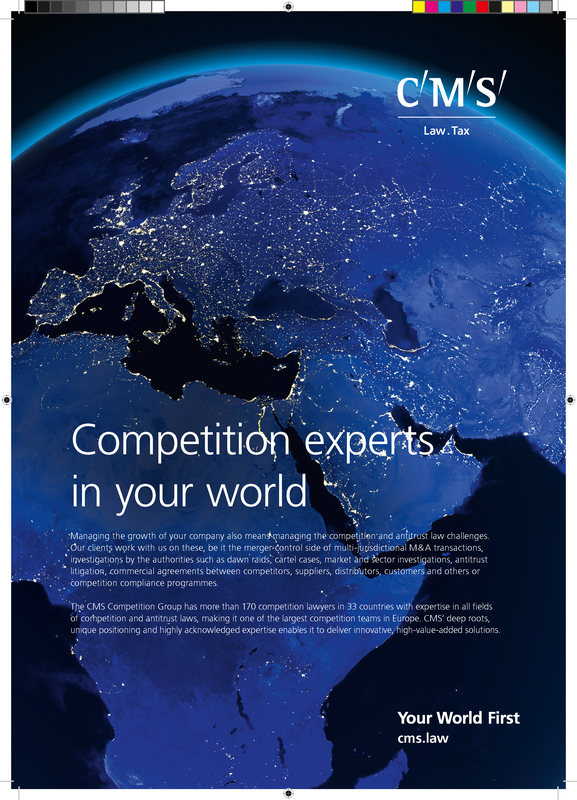 The firm counsels GB Foods on competition law issues, including compliance and distribution policies, and advises Medtronic in connection with antitrust and distribution-related matters. Vérgez acted for Schuler regarding the notification of its acquisition of the Italian presses manufacturer Farina Presse. CMS also advised the shipping company Boluda on the acquisition of two maritime terminals of Capsa in the Canary Islands. The firm is involved in several private damages matters that are confidential. Under the leadership of Who’s Who Legal: Competition nominee Patrick Sommer, CMS SWITZERLAND continues to represent clients in some of the country’s most important behavioural matters. The firm is one of the few to have advised two separate banks in the authority’s finance sector investigations: specifically Rabobank on Libor, Tibor and Euribor; and Bank Julius Bär on Forex and precious metals. Sommer is also leading Bayer Switzerland’s appeal against a decision by the competition authority that found the pharmaceutical company liable for resale price maintenance. Partners Marquard Christen and Stefan Brunnschweiler continue to advise Paul Koch on the window and door fittings cartel investigations, which the Federal Supreme Court referred back to the enforcer for reassessment after overturning the fines imposed on the company. Christen also represents a company in a pending appeal before the Federal Administrative Court challenging findings it allegedly participated in bid-rigging cartel in the construction sector. The team also advised suitcase manufacturer Rimowa in an investigation by the Swiss enforcer into an alleged restriction of exports of Rimowa products from Germany into Switzerland. In merger control work, Geneva partner Pascal Favre secured clearance for SNCF Group’s partial acquisition of BLS Cargo, one of the main actors in the Swiss railway freight transport market. Partners Christen and Alain Raemy advised major Swiss telecommunications provider Sunrise Communications on the sale of Swiss Towers – one of the country’s highest-profile mergers in 2017. CMS merged with Nabarro – previously a recommended firm – and Olswang in May 2017. Partners Brian Sher and Caroline Hobson co-head the competition team, which also includes legacy Nabarro partner Cyrus Mehta and legacy CMS partners Graeme Young and Satyen Dhana. The team has sector specialties in life sciences and healthcare, as well as financial services, energy, technology and communications. The firm advised GlaxoSmithKline on the CMA’s Paroxetine pay-for-delay probe, as well as the drugmaker’s appeal to the Competition Appeal Tribunal against the enforcer’s decision. The tribunal has now referred the case to the European Court of Justice. The team advises AON in the CMA’s investment consultants market investigations and Care UK in the CMA’s care homes market probe. The firm also represented BACS, Faster Payments and Cheque & Credit Clearing Company in securing UK clearance for the merger of their three interbank payment system businesses.